Choose one of the existing templates or create a custom ecommerce website design. Each template comes with its own theme settings. These settings allow you to customize your ecommerce website's design without requiring HTML or CSS knowledge. Change logo, fonts, colors and more. Make your ecommerce website have the look you like. You can also customize homepage and product layouts, add banners, ads, slideshows and more. Your ecommerce website can be displayed in any language you want. You can allow customers to pick a language they want or auto detect based on location. Virto Commerce supports local currencies, tax rates, prices etc. You get full control over all the ecommerce templates and can translate them to any language. If page doesn’t have any translation available then default one can be used instead. Depending on the theme used, the following translations are available: Danish, Dutch, Spanish, French, German, Greek, Italian, Japanese, Portuguese, Chinese, Swedish and over 50 other languages. Virto Commerce gives you 100% control over the design and HTML/CSS used by your ecommerce website and online shopping cart. 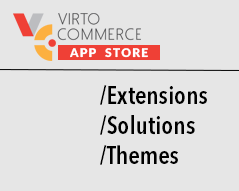 Virto Commerce utilizes templating language called Liquid. Liquid makes it easy to turn your HTML & CSS into a beautiful ecommerce website design. You can edit templates right in Virto Commerce Manager or using any other editor that you want. Templates can be saved in file system, database or remote repository (github) in order to be able to track all changes.